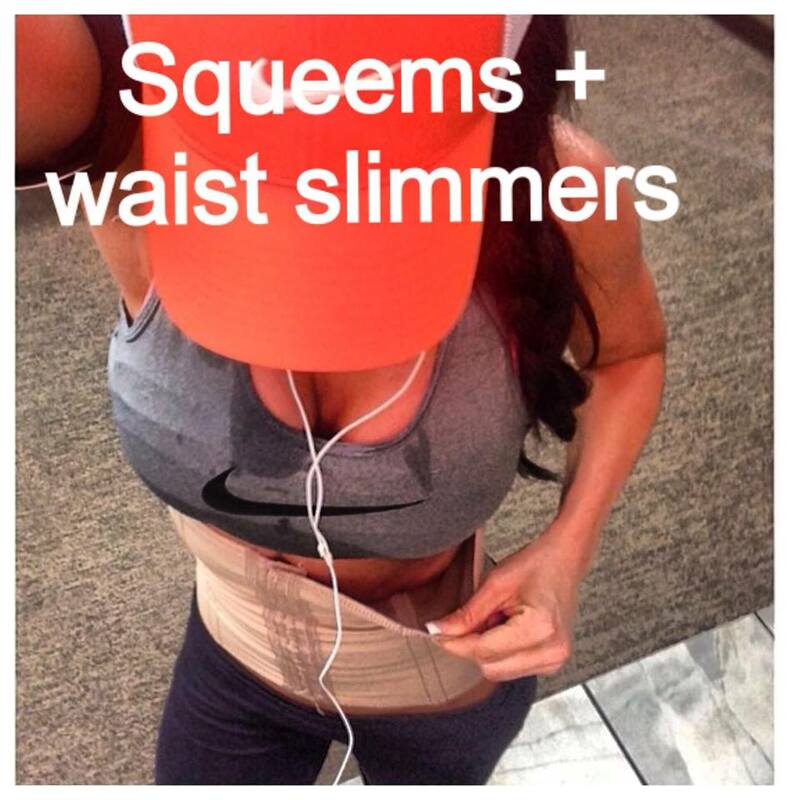 Alright another topic that I am chronically asked about lately is squeems and waist slimmers/sweat bands. Do they work? How long do I wear them? What is the purpose? Etc.. So since I was on the plane with nothing else to do and no internet connection I addressed these questions. First off, I want to make it clear that until this year I never wore a squeem in my life. I competed and did very well without ever wearing one, so the first thing you should know is that they are not absolutely necessary, however genetically I was gifted with a fairly small waist. 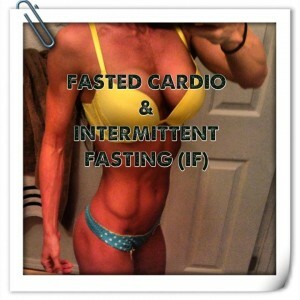 Please note they’re not a magic trick and wont instantly shrink your waist size or make your waist smaller overnight. Many top athletes wear them though because they swear they reduce the waist size and we all know bikini is all about that small waist. Its funny because so many of these girls keep it a secret, like its some hidden truth to achieving results, so when I posted a photo of mine on social media, go figure I had about 150 questions, comments, and concerns. Go ahead and look at Paige Hathaways profile, if you look closely at her selfie progress photos you will see she has lines running up and down her mid section… that would be from her squeem that she probably just took off lol. I got bashed by a few girls for wearing mine, as if it was shameful or cheating or something. Now if I was sleeping in that thing or wearing it excesively over a long duration of time I could see how some of the health concerns may play a part but I honestly wear it about 2-3x a week and only for maybe a half a day – if that. I do wear it when I lift legs and occasionally when doing cardio. I dont wear it for HIIT as I believe it can be too restricting for full oxgen capacity during high intensity excercise. I started wearing a squeem for a few reasons. My first year competing I had no background in heavy lifting and when I dieted down for the show my waist came in at 23″. That was pretty dang small in my opinion and I was happy with it. However, over the years as I have started lifting heavier and heavier and also implemented tons of different styles of lifting, including kettlebells, crossfit, german volume training, etc… I have noticed a slight increase in my waist size. Some of you may wonder why that would be and let me just ask you this; Have you ever noticed the elite level crossfit women typically have very muscular yet very square/blocky physiques – especially through the mid section? Go ahead and watch some of the womens world crossfit games on TV, youll see the majority of them have very square waists. That is due to building the oblique walls outward through heavy lifting. Just like any muscle group, you can add muscle mass to the sides of the abdominal wall and that will physically make your waist larger. Its not necessrily a bad thing if you are wanting to improve strength and you dont care as much about aesthetics, but in the sport of bodybuilding we train for aesthetics AND performance, with aesthetics at the top of the list. I noticed this same thing happen a bit with my own body as I implemented a ton of heavy leg workouts last year trying to get my glutes and hamstrings to grow and I also have a past with doing kettlebell and crossfit. So I had a few personal reasons for looking into a squeem. Please make your own choice on weather or not to buy/wear a squeem. I am not a doctor nor do I promote the use of one. I purely use this for my own aesthetic purposes. Do I feel it has made a difference? Honestly I do feel my waist is smaller this year but I havent measured it to verify that (update- I did measure after I wrote this and my waist did get back down to 23″ this year). I do have to mention that I dont know if this decrease is contributed to the squeem or from cutting my lower body heavy lifts down dramatically. Because I know I will be asked, I honestly dont even remember where I ordered mine, some website online. I have heard Ann Cherry was a good brand though. As far as waist slimmer/sweat bands go… I started using these in 2013. I picked mine up at Ross or TJMaxx or something and figured for $5 it wouldnt hurt to try it. I instantly noticed the increase in sweat that the waist slimmer caused around my mid section from internal thermogenisis in the area- which is where I hold some stubborn fat. I liked the way it heated my internal temperature up due to the neoprene material and I sweat so much more wearing one I figured it had to be doing something. I have continued to utilize these for the last two years. You can make your own decision on weather or not they work but I believe half the battle with results is your belief system. So if you feel its working, it just might. “Today I felt absolutely GREAT- more energy and positivity going into my workout than I have felt in a long time! Today I focused A LOT on contraction of the muscle along with the eccentric motion today with my lift. Eccentric training is defined as active contraction of a muscle occurring simultaneously with lengthening of the muscle . For example, in a biceps curl the action of lowering the dumbbell back down from the lift is the eccentric phase of that exercise — as long as the dumbbell is lowered slowly rather than letting it drop (i.e the bicep muscle is in a state of contraction to control the rate of descent of the dumbbell). Eccentric training focuses on slowing down the elongation of the muscle process in order to challenge the muscles, which can lead to stronger muscles, faster muscle repair and increasing metabolic rate.